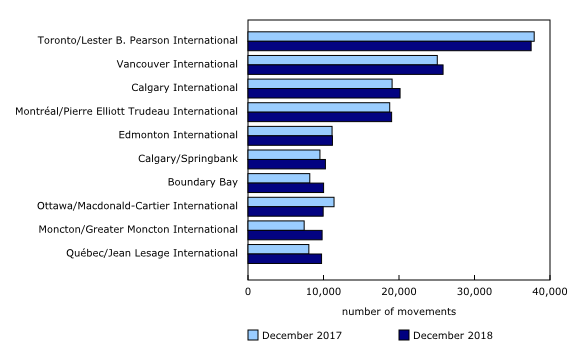 Aircraft take-offs and landings at the 91 Canadian airports with NAV CANADA air traffic control towers and flight service stations increased 8.7% in December to 387,035 movements, compared with 355,899 movements in December 2017. A rise in both itinerant movements (flights from one airport to another) and local movements (flights that remain in the vicinity of the airport) contributed to the year-over-year increase. Itinerant movements increased 5.1% to 284,017 and local movements grew 20.3% to 103,018. This was the second largest year-over-year increase in local movements since December 2014. 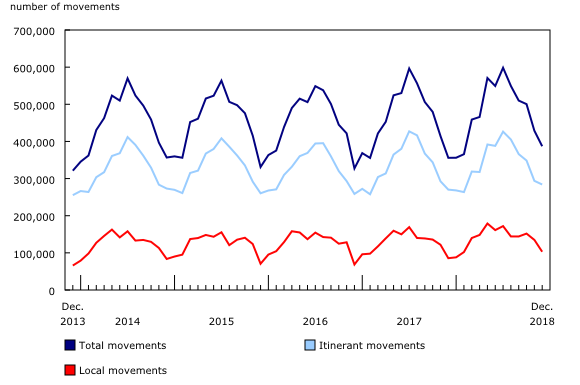 Domestic itinerant movements (within Canada) increased 5.5% year over year to 228,233 in December. Transborder movements (between Canada and the United States) rose 3.4% to 39,454 movements, while other international traffic was up 3.5% to 16,330 movements. In December, 10 airports accounted for 42.2% of total activity. Toronto/Lester B. Pearson International, Ontario, the nation's busiest airport, reported 37,498 movements, down 1.1% compared with December 2017. This was followed by Vancouver International, British Columbia, which reported 25,836 movements (+3.1%) and Calgary International, Alberta, with 20,140 movements (+5.5%). Additional analytical information is now available in "Monthly Aircraft Movements: Major airports – NAV CANADA Towers and Flight Service Stations, December 2018," as part of the service bulletin Aviation (Catalogue number51-004-X).